Alice Cooper was featured in a Super Bowl 52 commercial for Arizona-based Desert Financial Credit Union during the NBC-TV network broadcast of the February 4 event in Minneapolis, MN. 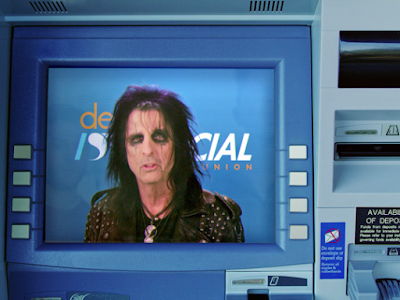 The ad, which promotes the company’s name change earlier this year from Desert Schools Credit Union, sees Cooper preforming his 1972 classic, “School’s Out”, as a way to emphasize the “school” was taken out of the credit union's name. Director Ze'ev Waismann explains that the commercial mixes reality and fantasy built around the shock-rocker’s image. "We wanted to design the interior of the bank to look like it would look if it was in an Alice Cooper fever dream," says Waismann. “We wanted it to feel very much like it was a working bank branch where you would still have tellers there, but they’re zombies, right? Loan managers but they’re all inspired by these Alice Cooper personas. And Alice Cooper, very much at the head of this experience, is on stage singing 'School’s Out.' "
The lead single and title track from his fifth album, “Sohool’s Out” delivered Cooper his first hit when it reached No. 7 on the US Billboard Hot 100 while the album peaked at No. 2 on the Billboard 200 on its way to sales of more than a million copies. Just days before the Super Bowl 52 matchup between the New England Patriots and the Philadelphia Eagles – which coincided with Cooper’s 70th birthday – the rocker was involved in a car accident in his longtime hometown of Phoenix, AZ. "Had a car accident this afternoon in Phoenix, but luckily everyone walked away UNHURT,” tweeted the singer hours after the Febriary 1 incident. “Very thankful for that and also to Dodge for building such a sturdy Challenger!!" Cooper will launch a spring tour of North America in support of his latest album, “Paranormal”, in Windsor, ON on March 1.